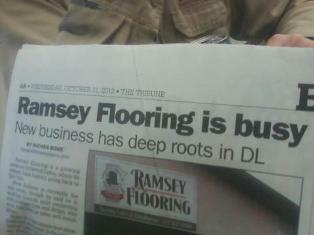 This Ramsey Flooring article appeared in the Detroit Lakes Tribune in the fall of 2012. 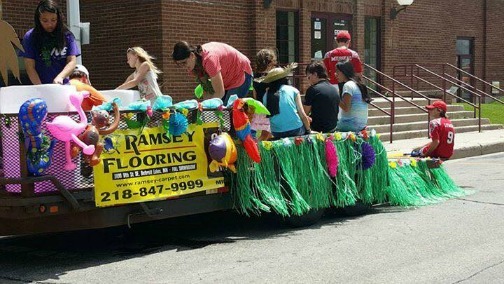 Ramsey Flooring is a growing presence in Detroit Lakes, where its owners have history going back to the 1950s. Steve Ramsey is currently the sole owner, though he said he is working toward joint ownership with brother Brian who works with him in sales and installation. Ramsey Flooring has its own installers and also works with independent contractors. Steve Ramsey has owned a floor covering business in Anchorage for more than 15 years and bought the building in Detroit Lakes last October, after renting space for about a year in a building near the Canadian Pacific tracks. Since Floors & More left its Detroit Lakes presence to consolidate in Fargo, Ramsey Flooring has been helping to fill the void. “Whether you want to carpet one room, add the look and feel of laminate flooring to your kitchen, or upgrade every floor in your house with the beauty and elegance of hardwood, we can meet all of your flooring needs,” the store says on its website. But it tackles commercial projects of all sizes. Some of its clients include Country Inn and Suites, the Edgewater condominiums, the Holiday Inn, Detroit Lakes Public Schools, the State Lottery offices in Detroit Lakes, the MMCDC (State of Minnesota Housing), BJ’s BBQ Grill, BTD in Detroit Lakes, Nereson Chevrolet, and the new Webber Family Ford Dealership. It’s a family business. Steve started working with his dad, Don, when he was about 16 years old. Don and his brother Darrell are both helping out at Ramsey Flooring. “Those two have been in the business for years,” Steve said. With another brother, Dave, who died a few years ago, “they used to be Ramsey Brothers Carpet” in Detroit Lakes. Steve’s sister Tanya is an artist who designed his business logo. Other employees include Shane Seaberg, who works in sales, Richard Haldorson, an installer who often works with Darrell Ramsey, and Katie Ramsey, who handles accounting and sales. Steve Ramsey grew up in Audubon and moved to the Twin Cities for a few years before moving to Alaska in 1990. Steve said his grandfather had always wanted to see Alaska, but never got the chance — so Steve made the move in his honor. Steve has a business there as well, Ramsey Carpet, which handles a wide range of residential and commercial work — including housing in the Alaskan oil fields and ongoing work at two military bases near Anchorage that requires meeting tight military deadlines. Lately he has been spending about half his time in Alaska and about half in Detroit Lakes. He has family working in Alaska as well, a daughter, Kara, and her husband help run the business there. His oldest daughter, Brittany, lives in England with her husband, who is a lawyer near London. His son, Jacob, just graduated from college and is a youth pastor at the First Assembly of God Church in Brigham City, Utah. Up until now, Ramsey Flooring hasn’t done much work in the North Dakota oil patch, but that may be beginning to change — it has jobs coming up in Dickinson and Williston. “We’ll go anywhere,” Steve said, noting that the business is licensed in both Minnesota and North Dakota. More travels may be in store, as the business is the only installer in western Minnesota of Protect-All, a hard-wearing, easy-cleaning thick vinyl flooring that is easy on the feet, looks like black rubber matting and is used in commercial kitchens and veterinary clinics. Ramsey Flooring has the training and the special tools — routers and saws — needed to weld the stuff together into a seamless floor covering. Steve handles commercial sales Shane handles mostly residential sales, and Steve said there is a lot of construction to keep them busy. “I’m actually surprised with how many new houses are going up in the area — it seems like a lot of building going on,” he said.